Fern peonies, also known as fern leaf peonies or Paeonia tenuifolia, are perennial shrubs valued for their large, ornamental flowers, ease of care and attractive foliage. The plants bloom during late spring and early summer, producing red flowers in single or double blossoms. Fern peonies are considerably rarer and more expensive than other varieties due to the difficulty of propagation, but container-grown specimens can usually be found in well-stocked nurseries. Native to temperate Europe, fern peonies thrive in zones 3 through 8 and require little care to cultivate throughout most of the United States. Plant fern peonies during early summer or fall in a location that receives at least 6 hours of direct sunlight each day and dappled afternoon shade, if possible. Ensure that the site consists of well-drained, fertile soil, and space fern peonies at least 3 to 4 feet apart to allow plenty of room for growth. Water thoroughly once every 10 to 14 days during spring, summer and fall to encourage deep root formation. Soak the soil surrounding the plants deeply at each application. Do not water during winter, when plants are not growing actively. Feed fern peonies once per year, during early spring just as new growth begins, using a low-nitrogen 5-10-10 NPK fertilizer. Apply at the rate recommended by the manufacturer's instructions for the best results. Do not allow fertilizer to touch the trunk of the plant, as burning could occur. Remove the seed heads that form after flowering ends to help fern peony plants conserve more nutrients for blooming the following season. Pinch off the seed heads at their point of origin to minimize damage and the risk of disease. Amend heavy clay soil with organic compost to increase drainage and fertility to adequate levels. 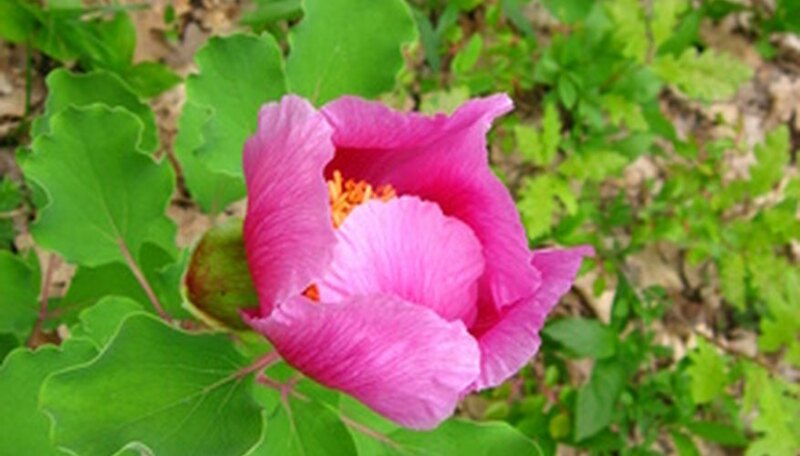 A 1-to-2-inch side-dressing of organic compost can be used to feed fern peonies in place of fertilizer if desired. Never prune fern peonies, as they will not grow back.